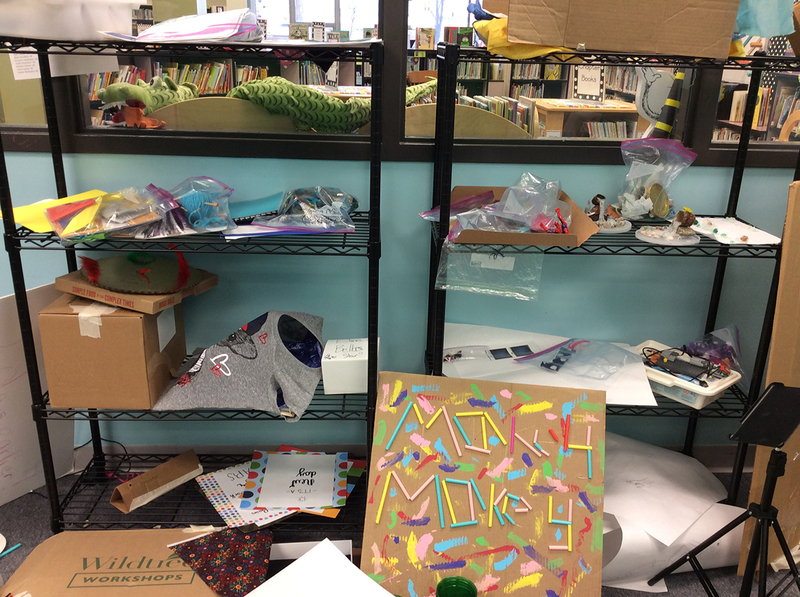 If there’s one thing I have learned about makerspaces in the last five years, it’s that they can get pretty darn messy! 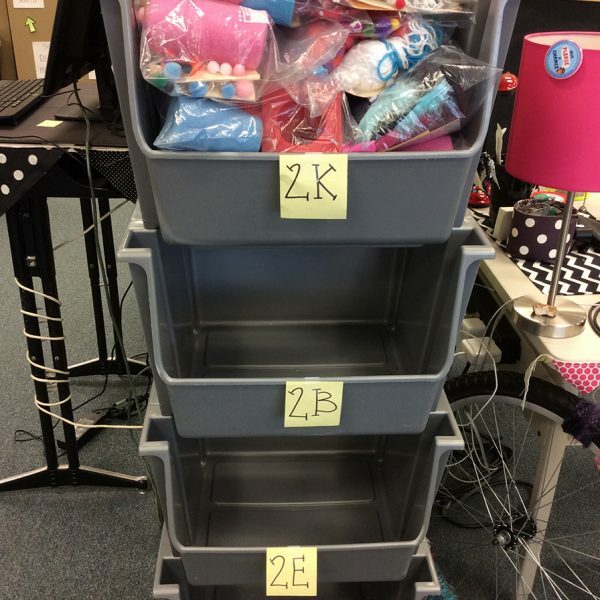 After several attempts at maintaining some order in our space, I have found an organizational solution that includes zones, shelf signage and container signage that has proven to be a system that works for me and my 610 elementary makers. 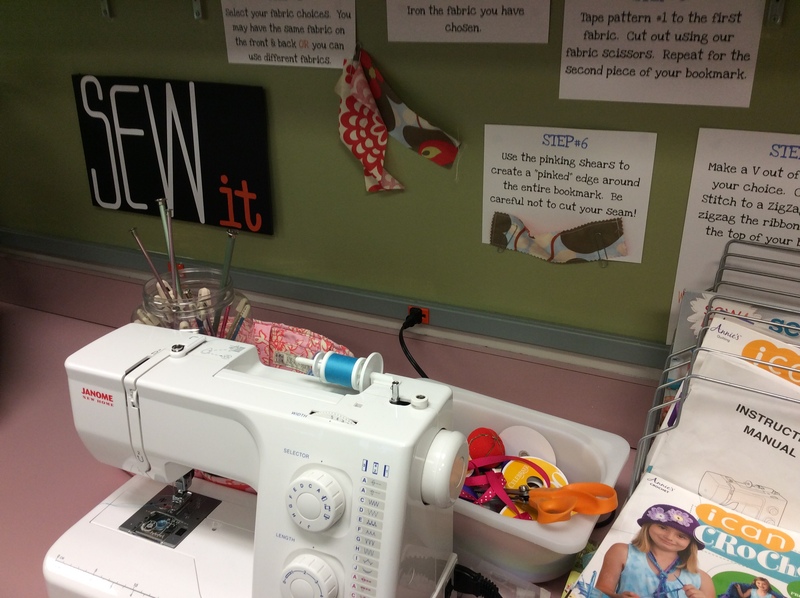 Sew It Zone: Kids will find our sewing machines, sewing materials, knitting needles, crochet hooks and yarn here. 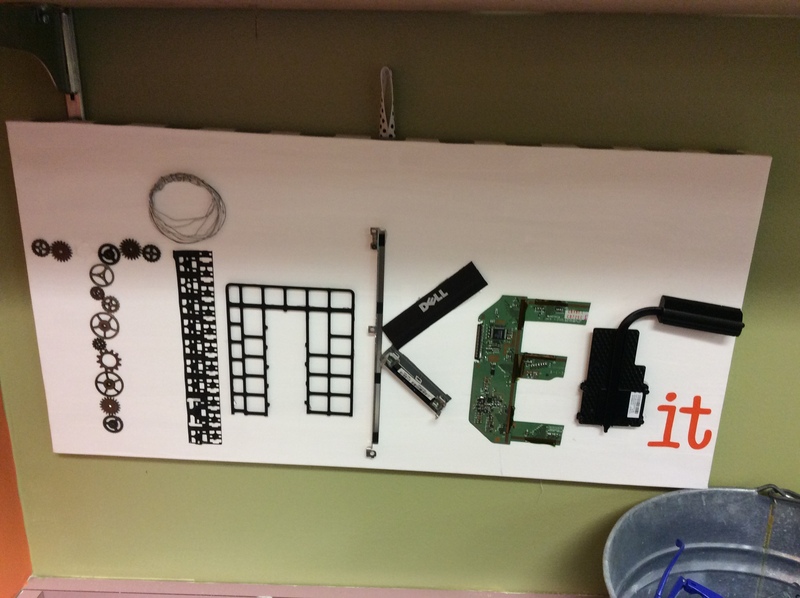 Tinker It Zone: This zone holds tools such as hammers, pliers and screwdrivers, as well as safety goggles and gloves. There are also various things that can be taken apart, such as keyboards, broken headphones, rotary telephones, musical greeting cards and so much more. 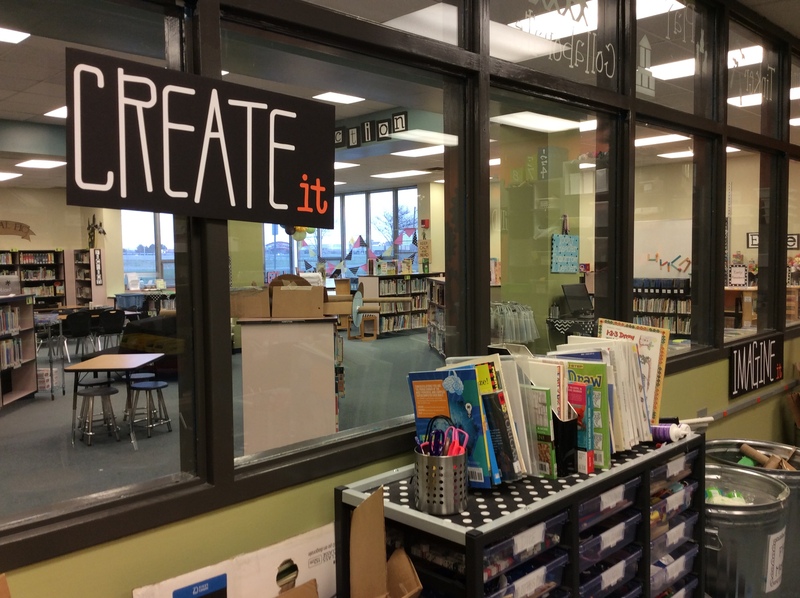 Create It Zone: This is where we keep large pieces of cardboard and all of our craft material. 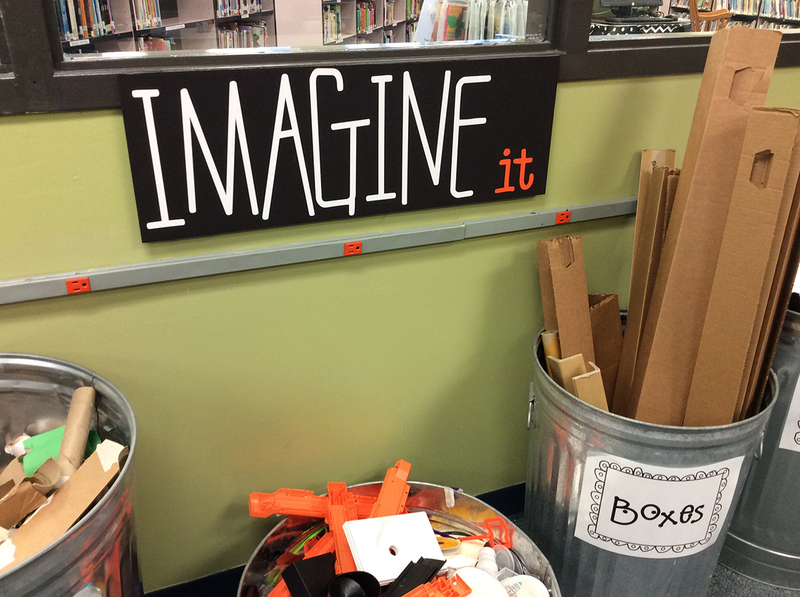 Imagine It Zone: We have our plastic materials, foam tubes, smaller boxes and cardboard tubes in this zone. 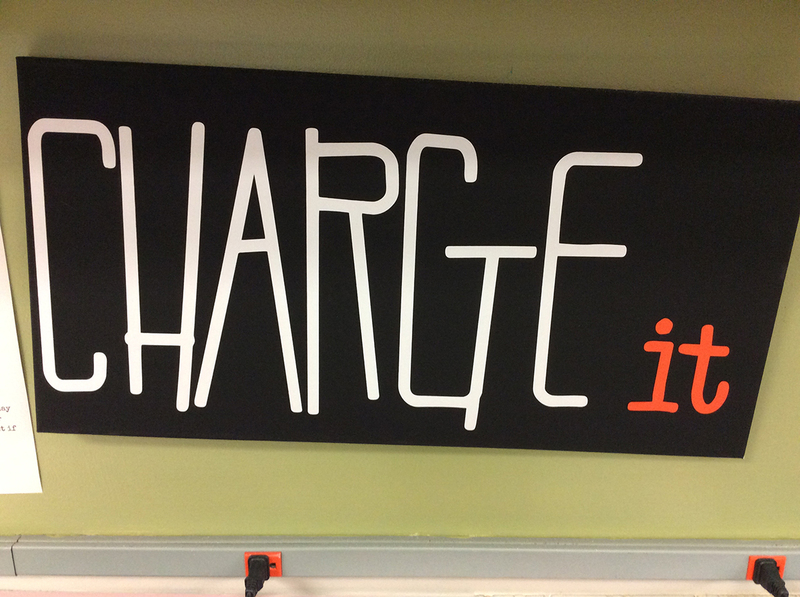 Charge It Zone: Here we house all our devices and robots that need to stay charged. 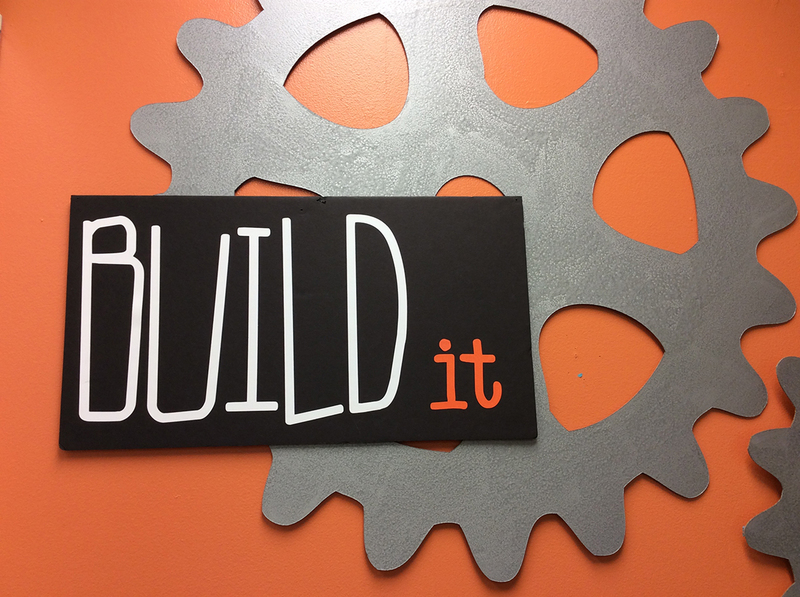 Build It Zone: This zone houses KEVA® planks, Duplo®, ZOOBs® and LEGO® build plates. You’ll find that you need a variety of storage options for all your pieces and parts. And labels, labels and more labels are a must! 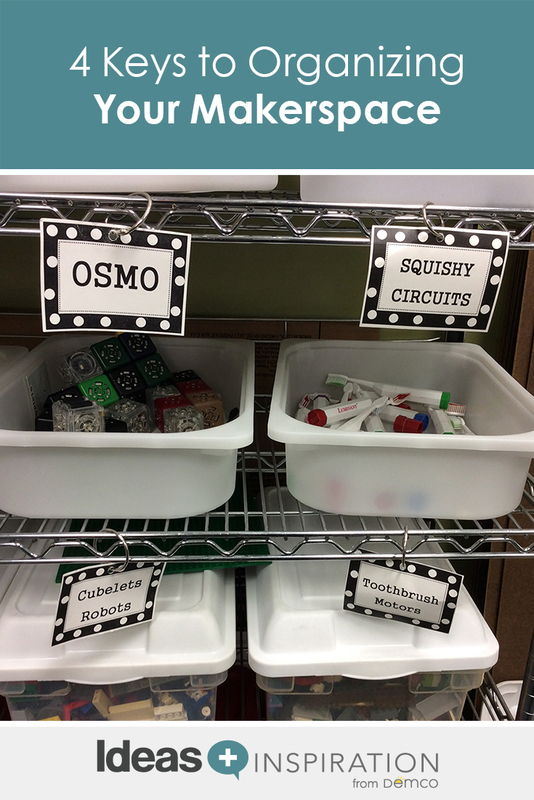 Providing labels on shelving allows kids to be more independent in finding materials they need for projects. Of course, they also need to be able to put materials back in the correct place, so others can easily get what they need as well. 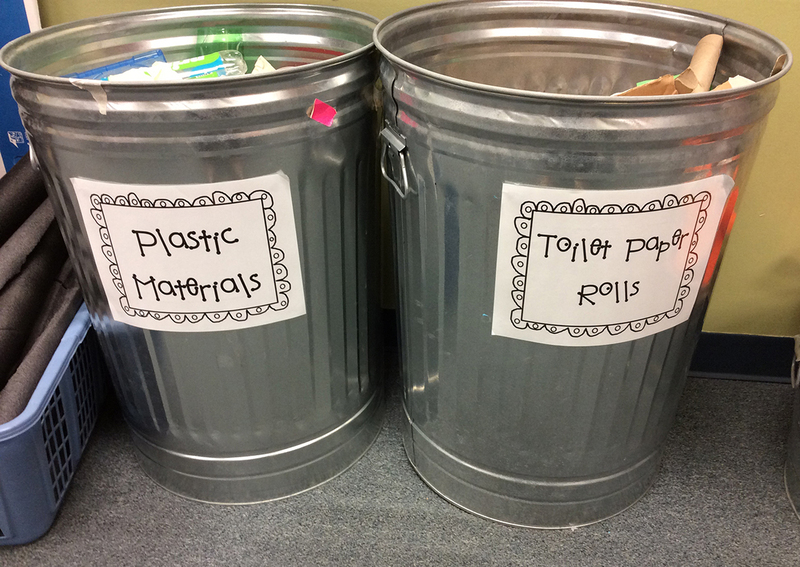 Our labeled garbage cans are a great way to contain all the tubes, plastic and cardboard that comes from donations. I opted for galvanized material because of the industrial look. Bins are a must. They don’t need to be expensive, and you will find them invaluable for keeping all your parts and pieces organized. Look for bins that come in multiple sizes (and fun colors), and you’ll find they work for most everything you have. 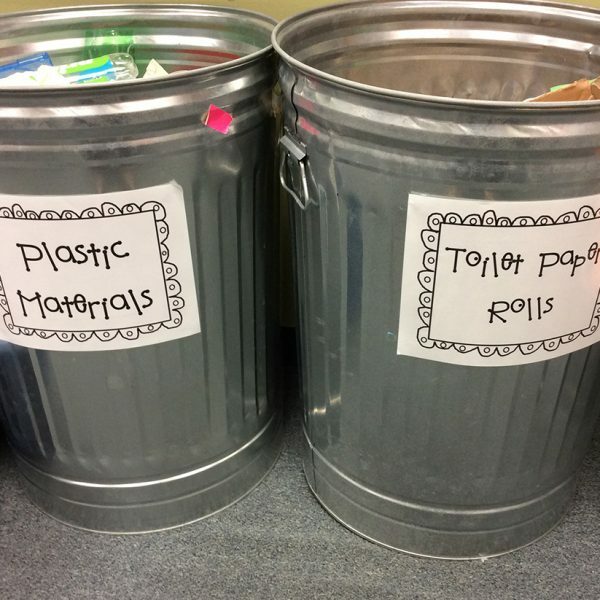 Your bins should also be labeled so kids can quickly find what they need. Carts can be pricey, but they are so worth the money! 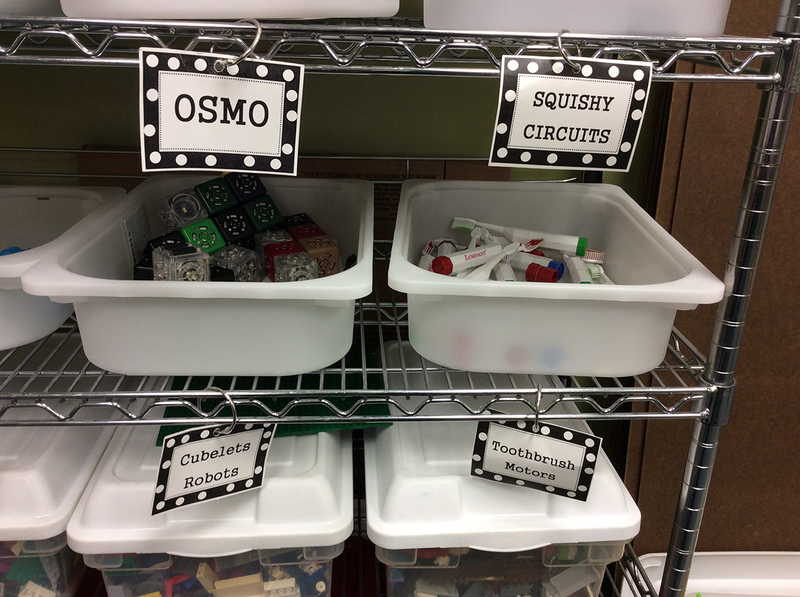 I love that mine rolls out to a workspace, and the drawers are clear, so makers can see what’s inside. 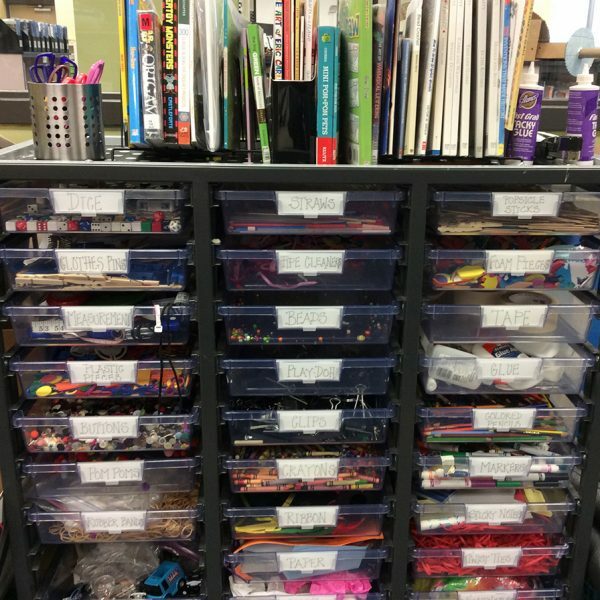 Plus, individual drawers can be removed so you can just take a few materials out to a workspace, or you can remove a drawer or two if you don’t want kids using a particular material for a project. 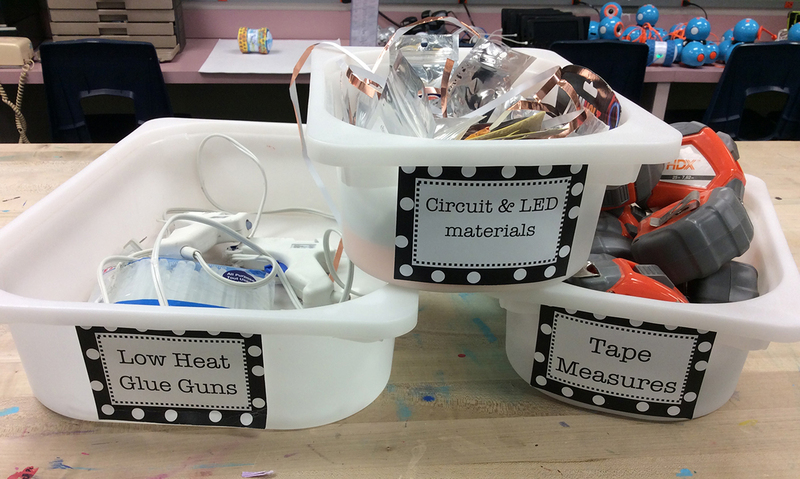 Find everything you need to get organized and enable makers to let their creativity loose. So where do you store all the projects kids are busy working on? This has always been a problem in my library and probably always will be. 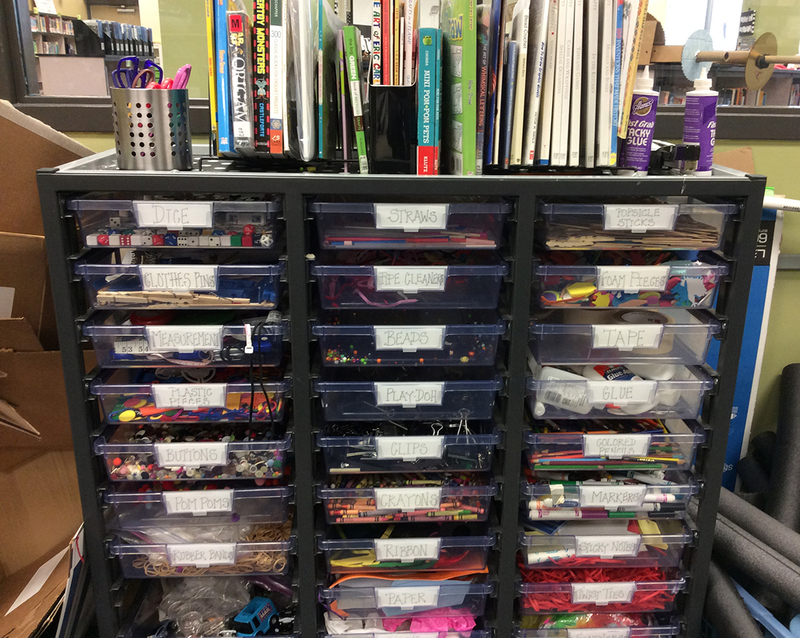 Two wire shelves in our production room store Genius Hour Projects, animal habitats, superbug projects, catapults and LEGO storytelling plates. 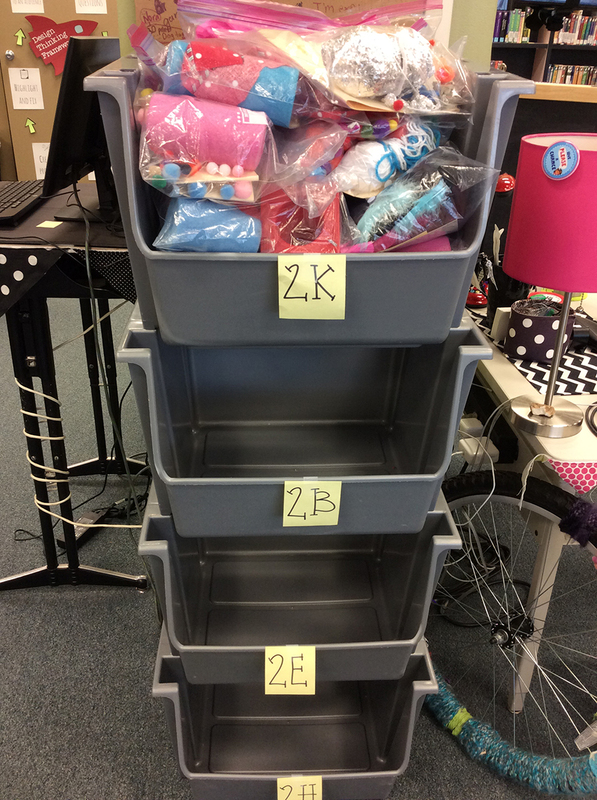 I also use utility bins labeled with teacher’s names, so we don’t mix up projects. 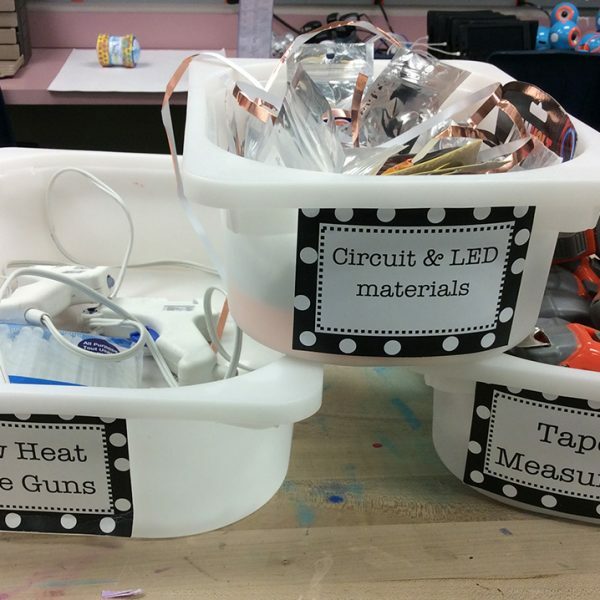 Ziploc® bags are great for projects that are ongoing, such as our art bot designs. Now, let’s be honest, do kid always put things back where they belong? No. Do they clean up after themselves when they should? No. Do they walk away from messes? Yes. But my students have learned that, as they leave, they need to clean up the space for the next group. Every couple of months I get a few volunteers who are willing to go through containers, bins and garbage cans to just make sure that things are where they should be. We find marbles in the magnets, scissors in the glue and thread in with the pipe cleaners. With 610 kids using the space, this is to be expected. 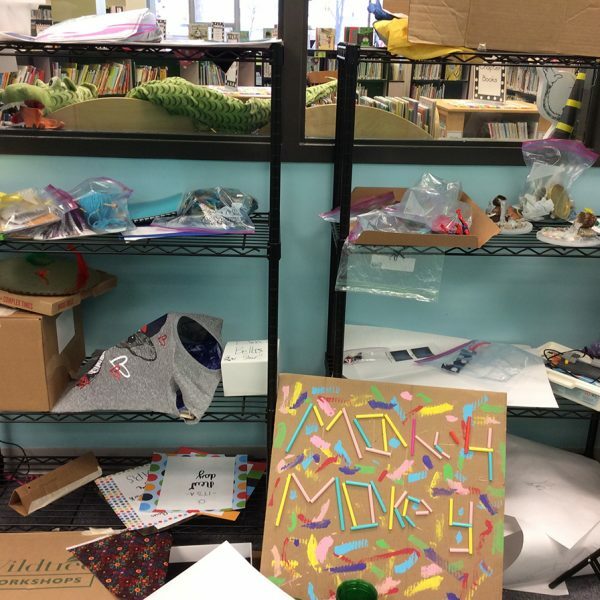 Realistically, makerspaces are bound to be (and probably should be) a little messy if students are given the opportunity to truly explore their passions and ideas in a culture of making. But with the right organization tools, you’ll keep your sanity, and your everyone will function better in the space. Angela is a teacher-librarian with 29 years of teaching experience at the elementary level. She is proud to teach at Lewis and Clark Elementary School, a two-time International Center for Leadership in Education Model School, in Liberty, Missouri. She has presented many times at Missouri Association of School Librarians (MASL) and will be presenting at ISTE 2017. 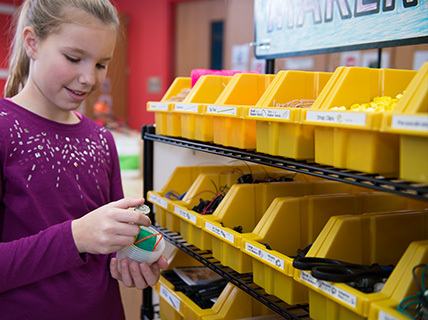 Her makerspace has been featured in multiple educational articles and was selected as the 2015 School Library Journal Build Something Bold runner-up. She was also featured as a Scholastic Teacher Cool Teacher in the fall of 2015. Angela believes in a balanced library program of making, thinking and reading. 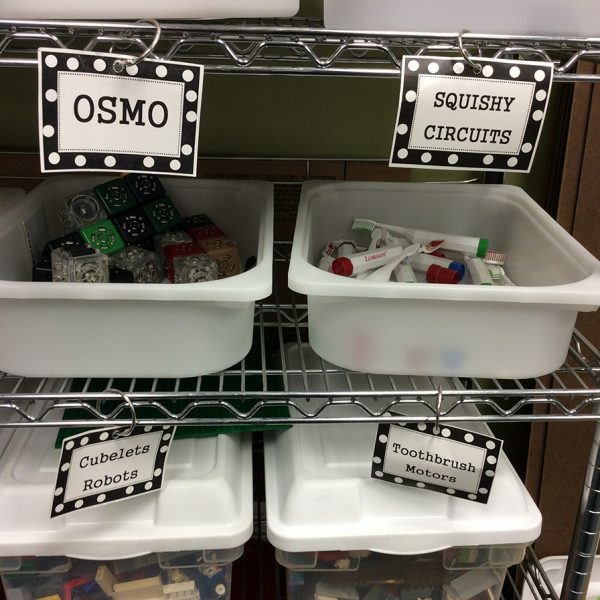 You’ll find a plethora of maker resources on her blog and her library website and can connect with her through Twitter at @ARosheim.